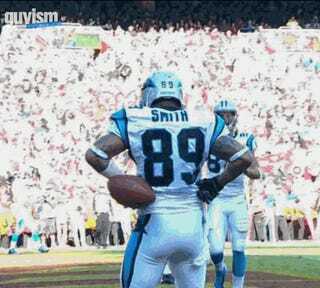 Steve Smith had himself a totally average day: 41 yards receiving and one touchdown. But it's what you do with yourself after the touchdown that counts-and did Smith ever do stuff with himself after the touchdown. Following a 19 yard reception in the second quarter Steve did this little (???) dance you see here. This has been your Sunday NFL GIFs semi-roundup.